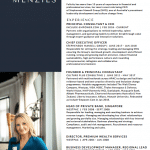 Based in Sydney, Australia, Felicity Menzies is regarded by her peers and clients as an authority on diversity and inclusion and a leading diversity and inclusion consultant in the global corporate environment. Felicity’s interest in the role of diversity and inclusion in business began during her tenure as the Head of Private Bank, Westpac, in Singapore. There she led a culturally diverse team of bankers serving a multinational client base and learned firsthand how inclusive leadership is a necessary component of business success. Now Felicity applies her business acumen and technical expertise as a leading diversity and inclusion consultant to help global organisations respond effectively to the opportunities and challenges presented by diverse workforces, unfamiliar markets, and rapid shifts in the competitive landscape. Prior to founding her diversity and inclusion consultancy in 2012, Felicity had 15 years of experience in financial and professional services with blue-chip companies, and has held senior positions in business development, project and change management, relationship management, and financial and operations control. In her most recent corporate role as CEO and Director of Stephenson Mansell Group (SMG), one of Australia’s preeminent leadership development and culture change firms, Felicity had responsibility for setting the strategy, leading and managing SMG ensuring the Group’s continued growth, development and efficient running, strong and growing market presence, robust financial sustainability, high performance culture and rewarding entrepreneurial, inclusive and collaborative professional environment. Prior to joining SMG, Felicity founded Culture Plus Consulting, a diversity and inclusion consultancy with expertise in inclusive leadership, unconscious bias, cultural intelligence and inclusion, and empowering professional women. Notable engagements include The Walt Disney Company, The Department of Premier and Cabinet (NSW),Westpac, Medibank. BBC, VISA, HSBC, Thales Aerospace & Defence, World Vision, NNIP (formerly ING), Scotiabank, Macquarie Bank, Abbott Pharmaceuticals, Chartered Accountants Australia & New Zealand, Liberty Insurance, Allianz, Monash University. Felicity is an accredited facilitator with the Cultural Intelligence Centre and the author of, A World of Difference: Leading in Global Markets with Cultural Intelligence and is a regular contributor to business publications including AICD, Forbes, Business Insider, Business First, Acuity, Inhouse Counsel and People Management. An engaging and polished presenter, Felicity is frequently invited to keynote inclusion and diversity topics in private and public forums. Notable engagements include Chair 2nd Annual Asian Australian Leadership Conference, Women in Gaming Australasia, DAWN/Westpac Cultural Diversity Conversations, DiveIn, Female Insurance Group Asia, PrimeTime Professional Women’s Network, Diversity in Asia Network (DIAN), and The Society for Diversity.